KT will be the first in the world to apply blockchain technology to commercial network to maximize value of network such as 5G mobile network. It also presented a blueprint of having South Korea’s blockchain market be worth $885 million (1 trillion KRW) by 2022. KT introduced ‘KT Network Blockchain’, which applies blockchain technology to network, and its business strategy on blockchain on the 24th. 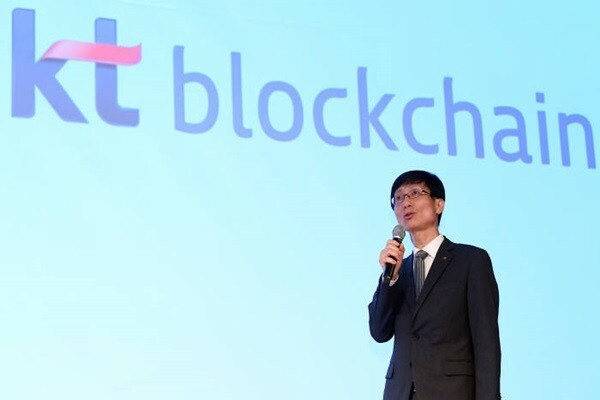 Department Head Kim Hyung-wook of KT Platform Business Planning Department said that KT’s plan is to create fundamental technology that will change the world by combining world’s best network technology and blockchain technology. It is planning to apply blockchain technology to 5G and 5 platform businesses (media, energy, finance, disaster and safety security, private and public) to establish ‘blockchain infrastructures’ that will be used by entire nation. It is certain that it has overcome low performance of public blockchain and low credibility of private blockchain by combining super-fast network and blockchain. It is planning to increase TPS (Transaction Per Second) from 2,500 TPS to 10,000 TPS by end of this year and ultimately to 100,000 TPS by end of next year. KT’s plan is to contribute to growth of South Korea’s blockchain market by establishing blockchain infrastructures, opening its platforms, and invigorating relevant ecosystems. When ‘KT blockchain’s is implemented through commercial network, daily lives are expected to change with telecommunication at the center. On this day, KT also introduced blockchain-based internet technology that implements connection and verification at the same time through networking based on ID instead of IP (Intellectual Property). Because this networking allows blockchain IDs to provide authentication to ever connection and hides IPs from network, it can prevent hackings, stealing of personal information, and DDoS (Distributed Denial of Service) attacks. It also prevents hacking of IP cameras for households. This networking also makes local currency services possible. Local currencies can be issued and distributed simply by applying blockchain-based verification technology that makes counterfeit impossible. KT mhows and Kimpo-si are currently discussing about ways to issue Kimpo’s local currency. Real-time settlements between countries are also possible by using ‘Blockchain Smart Contract’ that applies blockchain technology to roaming. K Tis also planning to use blockchain technology for global infectious disease prevention platform, healthcare record management, and transaction of contents. Prior to these plans, KT is going to apply blockchain technology to small-sized electric brokerage project. This project saves real-time energy production, electricity price, and energy production time into blockchain system and it is able to calculate as well. KT is also pushing for energy DR (Demand Response) by utilizing Blockchain Smart Contract and it is planning to expand its Smart Energy businesses such as electric vehicle charging business. KT is planning to expand KT Blockchain Echo Alliance that has 36 companies participating and open a blockchain verification center at its R&D center in Woomyeon-dong. This verification center will have facilities to verify blockchain-based infrastructures and services.